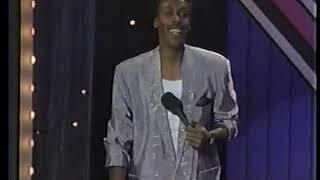 If you ask different people where they first saw Arsenio Hall, you’d probably geta number of different answers. But, it was the success of his Emmy Award-winning late-night talk show The Arsenio Hall Show that made Arsenio a household name. The versatile actor, comedian and producer first became involved in the arts at The Cleveland Playhouse, and continued to hone his craft through his Kent State University years. In 1979, Hall moved from Ohio to Chicago, Illinois where he tried his hand at stand-up comedy and was discovered by Jazz singer Nancy Wilson. In the following few years Arsenio toured, opening for twenty major headliners including Patti LaBelle, Aretha Franklin, Tina Turner and Stevie Wonder. A short time later, Arsenio attempted to diversify his career by making numerous appearances on television shows such as Solid Gold and The Tonight Show Starring Johnny Carson, and doing his first film cameo in Amazon Women on the Moon, directed by John Landis. In 1987, Arsenio was asked to replace Joan Rivers on the Fox Network series The Late Show. On the strength of his work as interim host, he was signed to a film and television deal with Paramount Pictures, which subsequently led to the opportunity to co-write and co-star in the hit comedy Coming to America. On January 3, 1989, The Arsenio Hall Show made its debut. Virtually overnight, Arsenio changed the face of late-night television by captivating young viewers across the country. During his successful five-year run as Executive Producer, Arsenio provided a forum for cutting edge comedy, politics and the television debut of such pop superstars as Mariah Carey, Snoop Doggy Dogg, Boyz II Men, and countless others. In 1994, Arsenio was again ready to grow and diversify. He resigned from the late-night gabfest to pursue other personal and professional interests. In 1998, Arsenio joined the cast of the CBS dramedy Martial Law, playing “Terrell Parker,” a streetwise L.A.P.D. detective, for two years. He followed this up with a two season stint as host of the new Star Search (CBS). And then, taking on his most challenging task to date, he returned to stand-up comedy and toured for the first time in over a decade. Arsenio was featured as the comical “Carl Cristall” in Exodus Films’ animated feature Igor,starring John Cusack. Arsenio appeared in a memorable cameo starring as “Tasty Freeze” in the highly touted feature comedyBlack Dynamite, an homage to classic blaxploitation films. In addition, Arsenio was featured in the HBO sports documentary Magic & Bird: A Courtship of Rivals which premiered in March, 2010, as well as the A&E two-hour documentary special The Battle For Late Night, which premiered in April, 2010. He was also featured in the NBA Entertainment documentary The Announcement,, where he shares his insight and experience surrounding the day of Thursday, November 7, 1991, when Earvin “Magic” Johnson made people stop and watch at the Forum in Inglewood, California, announcing he was HIV-positive and would be retiring from basketball immediately. The documentary gets to the core of Magic’s incredible personal journey and explores how he continues to prosper and thrive two decades later.Arsenio was featured as a “Guest Mentor” on the OWN Network’s Your OWN Show, as well as appearing as guest host on the daily talk show Access Hollywood LIVE!, CNN’s Piers Morgan Tonight and The View. Arsenio was crowned the “Celebrity Apprentice” for Season 5 of Donald Trump’s hit reality show on NBC, where he competed for his charity, The Magic Johnson Foundation. Most recently, he returned to late-night television as executive producer and host of the CBS Television Distribution/Tribune Broadcasting nationally syndicated The Arsenio Hall Show, which aired on stations around the country during the 2013 - 2014 season.SERVICE FEES APPLY TO TICKETS PURCHASED BOTH ON-LINE AND AT THE TICKETBOOTH.Must be 21 & up to enter; except on Friday's at 10:30pm which is 18 & up to enter.